Increase your productivity. Watch Igor Ridanovic's Wacom Control Panel tutorial. The quickest way of slipping clips is to select 'clip' timecode below the timeline, then simply select clip, and use square brackets. Hit Windows-R to pop up the 'Run' dialog and type 'cmd'. Type "net start Tablet Service"
Put this in a .bat file to make life easier and keep it on your desktop. If you are making an adjustment to an effect slider and the value takes off and you have no control to make adjustments. Restart the DS application or go into My Computer>Manage>Services and stop and restart the Tablet service. Or right click the slider and change it to classic mode, or if you're in classic mode then change it to low sensitivity in relative mode. Or Unplug tablet USB and plug it back in. There are USB problems with Wacom that weren't there when they used serial port. Please note: there is no Serial port support in 64-bit DS any more. Or go into the Wacom Tablet Properties and change the functions to all be disabled. This will work until the Tablet Properties file gets changed. Or disable all the buttons you do not use. You may experience a behavior that's similar to an invisible hand scrolling up and down the touchstrip. Windows with scroll bars will scroll up and down erratically. This is a USB related issue and to fix it avoid using a USB hub or disable the touch strip in the Wacom settings. You can fix it temporarily by unplugging and plugging back the USB cable. Another problem you may experience is that the tablet sometimes freezes after a text field input i.e. completing a "Save As" dialog box will freeze the tablet. I have found no other way to fix this than to lift the stylus out of the range and lower it down again. I have this issue at home and it persists over multiple versions of the drivers and operating systems. I think it's hardware related. These can be a huge timesaver in sessions. This will be a subject of my upcoming tutorial at Avid.com. Some people tend not to use them though. The least you can do is map arrow left and arrow right keys to the tablet buttons using the Wacom setup so you can jog with one hand while holding the stylus in the other hand. Any combination of keystrokes can also be programmed into the tablet buttons. This is like having a little macro utility at your fingertips. Even the touchstrip can be configured or disabled. For example, you can configure it to perform DS Zoom or timeline shuttle. These are fully programmable. I typically assign right mouse click to the top button and ALT to the bottom button. (ALT is for Photoshop use). All these button assignments can be application specific. You can create sets for DS, Photoshop, etc. And you can change configurations on the fly depending on what you do in the DS. You don't even need to close down the Wacom setup box which can be found in your Settings/Control Panel. Since our update to 10.3 we have had problems with the Wacom. In general it seems more sluggish and less precise. Make sure you have the latest drivers for your tablet. For example, if you are using the HP Z800, you can get the driver here. If you are not, simply select the specific workstation from the website menu list. The Wacom driver version for ds 10.2 and 10.3 should be version 6.1.1-3. Up to 10.1.2 it was 4.96-8, and that one had problems. When we exit Media Composer, it appears to close "most of the way" then the screen "gray's out" and then it just stops. If we click the Close "X" icon an error box appears saying that MC has stopped working. Click OK and it goes away. No harm being done to the projects, but it is not real pretty! This is an issue with the Wacom virtual HD Driver. Just disable it in device manager and it cures the lock up on exit issue. To warp, create two shapes that define areas of the image to warp between and join the shapes by drawing a line between them. The direction of the joining line determines how the shape will warp. The two shapes to warp between should be drawn in the same direction to avoid the warp from flipping over itself. It is recommended to use Scaling Interpolation and Super High Precision when warping, but do not use these settings until you are happy with your Warp. They increase processing time considerably. Correspondence shows how one shape gets to the next. Density, Default value is 8. Allows you to edit points with in the warping shapes. Wiggle the brightness control up and down. Thanks to Tony for remembering Lucas Wilson's technique. Another simple way to obtain #2 - #4 is to use your tracker to track a vibrating and/or fast moving object...like a hand held shot from a vehicle shooting another vehicle. Then copy the curves from that (you will then have x and y curves available). Thanks to Mark McArdle for this tip. wiggle z rotate very slowly then var freq=(Fc/10), if you want it fast and spastic then var freq=(Fc*3). The multiplier would correspond to pixel units or rotational degrees. This should get you similar results as After Effects wiggle. noise returns value between 0 and 1. This increases the scale of effect. Thanks to Paul Hessell for this tip. He provided two presets. Note: Windows Media 9 encoders and all Windows Media players require the use of DirectX End-User Runtimes. Previous versions of this runtime module worked just fine with the DS and it is believed to work with both Windows XP 32 (Service Pack 2) and Windows XP 64. Using the standalone encoder do dual-pass VBR encoding. Start with New Project, select the source file, click through the next screen, then select 2Mb/s as the video data rate, click Finish. Now go to Properties and, if the source is NTSC Anamorphic, select Edit on the Compression tab, and select "Non Square pixels". On the next tab (Video Size) select "16x9" on the Pixel Aspect Ratio drop--down box. On Processing, select "Deinterlace". If you have an HD source, do the same, and keep the output size to around SD frame size. Do not make WMV files straight out of the DS. For more information on Windows Media, please read Ben Waggoner's article. Great Tip: Set Microsoft Windows Start Bar to the top of the screen and set to autohide. annoyingly pop up over DS interface, unless you hit the “Windows button”. Closing all open windows in a path: Hold down the shift button, while pressing the close box. As an alternative you can set your folder option to open each folder in the same window. If you need to open a folder in a separate window you just hold down the control button while double-clicking the folder. To close down multiple windows from the same application that appear on the task bar, hold down [CTRL], use Windows-M to minimize all windows, and Windows-Shift-M to maximize them. Right-click one of the windows. Hit Close-all the windows close. Command-M minimizes all open windows. [Shift]+Double click on a folder opens it as an Explorer. Tip: In the Displays control panel set reports option to screen one or two. Avoids the “Split dialog boxes” between two monitors. Windows Command Tip: [ALT]-[TAB] will take you to the Windows application switcher. Bring up the Task Manager by pressing control-shift-esc . If you run into trouble with Windows, try hitting F8 while booting... will take Windows back to the last time you logged in. from C: drive, or How Microsoft's much-vaunted operating system eventually drowns in its own trash. Delete the contents of the C:\temp folder. Find and delete unnecessary graphics files (*.bmp, *.tif, etc.) using the Windows Search utility. Uninstall any software that is not critical to your editing work. There is the event viewer log that can be cleared from the event viewer itself: In Windows 2000 and Windows XP (and XP-64), it is in Computer Management (right click My Computer > Manage) or Start > Settings > Control Panel > Administrative Tools as a standalone utility. From the log menu you can clear each of the three logs: System, Security, and Application. Make sure to regularly delete C:\WINNT\user.dmp after a crash. Move your swap file to the F: drive. Look in the documents and settings folders for the Temporary Internet directories. Look for NtServicePackUninstall using the find utility. This file contains NT service pack uninstall backup information, and can be safely deleted. *Note: .dmp files in the \DSSystem folder are MEANT to be there. If you delete them, VIE won't include them in the CAB file and development won't correlate DS crash information with Windows dump information (dmp = dump files). It is recommended to delete them in a normally healthy system that is not experiencing problems periodically. If you are having problems, preserve these .dmp files so that they will be useful if you need to send a CAB file to Avid Support See Support. Back up your registry on a regular basis. It's a good idea—particularly before installing a new piece of software-- to go to Start->Accessories->System Tools->Backup, and click the 'emergency repair disk' option. When the next dialog comes up, CHECK the "Also backup registry to repair directory…" and hit OK - you don't have to actually make the floppy every time, since what it writes there is only of limited use anyway. But the key is that now in C:\winnt\repair\RegBack are a set of your current registry files, in case an install or something else goes catastrophically wrong and inhales your registry. 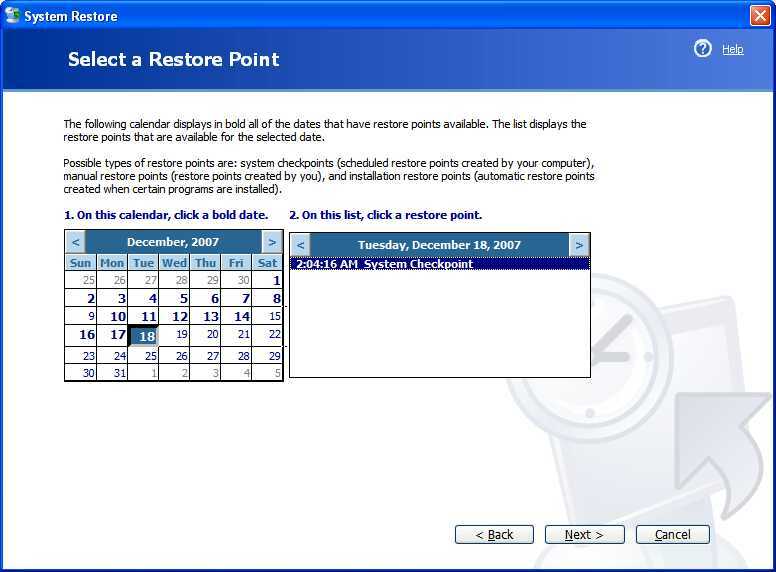 For more information about how to use System Restore in Windows XP, please see Microsoft's Webcast. As long as System Restore isn't disabled, it generally does a checkpoint each night and whenever software is installed. Just go to C:/programs/accessories/system tools/system restore and select restore to an earlier time. You'll get a calendar with the checkpoints, then pick the most recent when the system was working properly. Note that there is a user preference to set the amount of disk space allocated for storing restoration information so if only a small amount of space was reserved it's easy to run out of checkpoints. When the system needs space it will overwrite the oldest restoration info. It's always a good idea to back up projects and documents before doing any software installation or disk recovery activity just in case... Even though it's not "supposed" to affect that. If the system can't restore to the date you pick you'll get a message telling you that when it tries to go back and fails. You can then pick an earlier day but, the farther you go back, the greater the likelihood that you'll run into the disk space limit. According to Avid, System Restore degrades the performance of DS. Their Knowledge Base article 70880 last updated 07/16/2008 suggests that it be off in their article on Windows XP optimizations for Avid DS. Thus, this practice is deprecated by Avid. If all of your DS icons become generic, you need to install a QFE that will correct the problem that is caused by a Windows Update. You can find the solution to this problem on Softimage's website. Make a copy of your hard disk. This is the "Home" version that works just fine for DS installations. They also sell multiple licenses. It supports XP, Vista and Windows 7. Can perform either an incremental imaging or just as easily image an entire system. It works with Windows 7 installations. O&O's DiskImage 2 was recommended by Jim Fink of New Century Digital Media back in 2007. Backup and recovery for PCs. NB: Symantec's tools in general have been deprecated. Even though I am very careful, my personal DS acquired a nasty virus last week (thank you mr. client who sent me a .doc with a virus) that locked me out of the task manager, locked me out from editing the registry, and eventually disabled my keyboard and mouse, in addition to no longer allowing me to even log in or boot up the computer. After painfully trying work-arounds and safemodes and whatnot for 4+ hours, I remembered that two years ago I made a ~$75 investment in Norton Ghost. I popped in my boot disk and within 5 minutes, my entire system was restored sans virus. Do yourself a favor.... purchase a disk backup program. You won't regret it! With the xw8600 Avid ships HP's Backup and Restore Manager and I had some opportunities to test this utility. It is totally unreliable I found. Most of the times it produces an error when backing up. Then I finally had two versions of complete backups of the C: Drive. Some weeks later I had to restore the C: Drive due an installation mess of Procoder. First when backing up, you are able to backup on the Video Array. When restoring, there is no way to access the backup from the Video Array. so I copied the files onto the internal drive. Then I tried the newest Backup, got an error, then I tried the older one and it worked. At least i could restore one of the backups. These applications will get you back up and working within minutes if your C: drive dies and/or Windows XP corrupts itself. If you're forever tinkering with your C: drive (which is bad practice) you might want to consider daily backups. Use Good Sync to keep a copy of your active and inactive projects. Be sure to tell GoodSync to back up invisible files, too, so you don't have problems. Or use Microsoft's Sync Toy which is a little harder to configure, but it is free (Note: Use version 2.0 or above). Or you can use Handy Backup combined with a batch file that will copy your files out to a server upon shutdown. When archiving projects make TWO copies of the archive (eg two DVDs) just in case one of them gets stepped upon. Get a protected RAID video storage when you replace your U320 array. UPSs and/or Conditioned Power for everything in the facility, or as much as you can put on. Every 2 weeks or so get behind all your gear and do a thorough dusting / cleaning. up the project indexer and cause the RP not to work properly. set the selected drive to delete directly. You can free up to 10% more disk space. He booted his xw8600 and pressed F11 to use HP Recovery. After the recovery the C:\ drive was still not recovered, but the VideoRaid SR was repartitioned with a new fresh Windows install"
"I recently rebuilt a xw8200 and had to disconnect a second internal drive to prevent the HP recovery DVD from always wanting to install on that drive. Unlike a standard windows installer that asks you where to install." Disconnect all but the System drive when you have to do something like this or there will be ugly surprises. During boot up the system looks at things like storage and hosting and adjust to get the sited to come up -- whether it is the way it used to be or not! NB: This is not specific to DS or the HP installer. If you are doing a clean Windows install on a boot drive that already has two partitions, like C: and D: on one physical drive, and you think you're installing fresh to a clean C: partition - you may have serious problems. It can put the boot.ini and the NTLDR files on the D: drive. It all works and you may not notice what it did. But if some future software needs to modify the boot.ini, it will fail. This bit me when adding the Unity Connection Manager to a recently rebuilt wokrstation - it would not install. Start over with a single partitioned boot drive. If you are upgrading to DS Version 10, which runs on XP-64, you can get the OEM version from Newegg. Their list price is $140 (USD) as of October, 2008. They do not ship to Europe or the Far East. They do have a Canadian company that ships to Canada but I did not see XP-64 on that website. Sometimes Windows 7 workstations become invisible on the network. Two fixes are here. Draw a line and track the endpoints of the lines, animating the clone offset as necessary. Create a composite, where layer1 = layer2, except that layer 1 is offset by a DVE of 1 or 2 pixels in X or Y. Paint through to the layer below instead of cloning. The track will still be the same, but for some shots this is a better technique to paint out the wire. User Raster Mode and Copy Burned Frames judiciously. Although it will still be a frame-by-frame process, it's a lot less arduous moving a stroke than repainting it. a. Stabilize the shot based on a wire point. b. Apply a Clone stroke that works on the stabilized shot. c. Copy the X and Y translation curves from the stabilization tracker to the X and Y translation curves of the Clone stroke. This basically creates an X/Y motion curve that accurately describes the motion in your shot. Then, you take those curves and apply it to a stroke. Remove the stabilization, and the stroke now has a motion curve that follows the shot. Perform the computer name change. Run Configure DS Workgroup and select "Change logon information". Change the computer name in there as well (notice that it keeps the older computer name, so be sure to spot that and replace it with the new name), then enter the proper user and password for your DS Workgroup (or Standalone, same difference...). Wait for a re-index of media. This must be done for each project you have on your renamed system. Please note: If you archive projects (as well as the media) and restore these projects to a renamed computer, they come back as if you originally saved them on that computer with that name. This is the same behavior one might expect if one restored an archive to a different workstation. Everything comes back and is stored where it is supposed to go and you are ready to get to work. If you have multiple DS Workstations, a workgroup controller can reduce the load on the DS workstations. You do not need an additional DS license. It is recommended that your Workgroup Controller be a CPU that is as fast or faster than your DS workstations. There can only be one (1) Avid Project Indexer (also known as the Controller) for a defined DS Workgroup. There can only be one (1) Avid Interplay Media Service (Broker) for a defined DS Workgroup. There can only be one (1) Avid Throttle manager for a defined DS Workgroup. There is one (1) Avid Media Indexer installed on each of your Avid DS installations, even if just Software and RP, and even if not used. The Media Indexer is the only DS service that exists on multiple machine in a DS Workgroup, and this is to exchange media location and information between DS clients. To understand the terminology a bit better, please go to the Avid website. When you install the Workgroup controller, you may have to include the DS software checkbox in order for the Controller to work right. If the DS client kicks back a locking error on starting a project, that's the problem. You don't license and never ever start that DS (it could go into training mode), just let it install. You may have a problem doing this on a Server 2003/64 system or any system where you may not be able to install DS, check the fine print on Controller only installation. Another problem that was unique to my test setup, but just solved today - running the Remote Processor, Interplay-DMS and Workgroup Controller on one box. After many re-installs It all finally worked great, An ATTO fibre card and drivers were installed but not the Unity Connection Manager. After installing Unity Connection Manager, but still not physically connected on fibre, the Remote Processor became totally unusable, hanging up on "merging adapters". The fibre must be plugged into the switch once Unity Connection Manager is installed even if it's not being used. OK, you have a tape with someone over 20 who is noticing their wrinkles on that wonderful HD display you have in your suite.